What is Wii Homebrew and How Do I Install It? A gaming reviewer who specializes in Nintendo consoles, games and peripherals. You may be hesitant to explore the mysterious world of Wii Homebrew, in which devoted hackers have created a system that allows gamers to install software such as console emulators and media players onto their Wiis. There are risks; it could void your warranty or even put your console at risk. 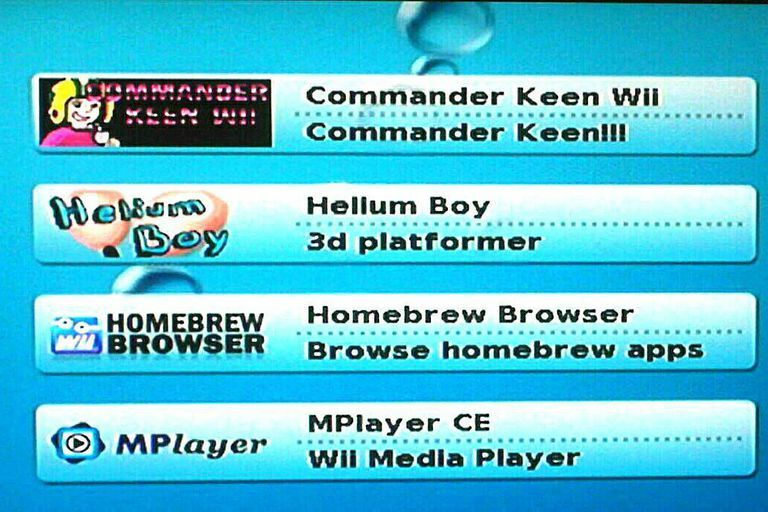 Homebrew also has the potential to confuse and aggravate - but once you take the plunge, you may find it opens up a world of new Wii possibilities. What on Earth is Homebrew? Homebrew refers to the ability to run software on the Wii that is not licensed or sanctioned by Nintendo. This includes homemade games, game engines that can run old PC games and applications that do things like play DVDs through your Wii or use the balance board as a scale. You can even back up your Wii settings and save games to an SD card so you can restore them in the event your Wii goes bad. This last technique can also be used to run pirated games, which is one reason Nintendo keeps trying to eradicate homebrew with system updates. The software to do all this is free, although some shady operators package and sell these free tools. Don’t buy anything; just refer back to the tutorial mentioned at the top of the page and do it yourself. Hackers look for hidden passages into the heart of a machine, and the first secret door found in the Wii was the Twilight Hack, which used an oddity in the game The Legend of Zelda: Twilight Princess to allow users to install homebrew software. One of Nintendo's periodic system updates closed the secret Twilight Princess door before we'd ever heard of it. But later a new hack arrived called Bannerbomb. Unlike the Twilight Hack, Bannerbomb does not use a game to open up the Wii, but rather uses the console’s own operating system. Bannerbomb opens up a hidden passage for a program called the HackMii Installer that can install the Homebrew Channel, an interface through which you can use Homebrew applications. HackMii also installs DVDx, which unlocks the capability of the Wii to read DVDs (one of the mysteries of the Wii is why Nintendo doesn't support this functionality even though it's built into the hardware). Put Bannerbomb and the Hackmii Installer on an SD Card and you can soon have your own Homebrew Channel. This shows up in your main Wii menu like every other channel, offering a portal to homebrew software. After installing the Homebrew Channel by putting Bannerbomb and the Hackmii Installer on an SD Card, putting that in a Wii and following the instructions on the Bannerbomb site, we wound up with a screen showing bubbles continually floating upward. Needless to say, it was confusing. Bannerbomb doesn’t explain this, but you also need to put applications on that SD Card in a folder called /apps. First download the Homebrew Browser (HBB), which allows you to browse a list of homebrew games and software and download them directly to your Wii from the Internet. If you have problems with HBB try reformatting the SD disk. The HBB should work after that, making installing new homebrew software as simple as choosing it from a list and clicking Download. Without HBB you have to copy software from your PC to your SD card to install it. Next, we installed SCUMMVM, which lets you play old LucasArts point-and-click adventure games on the Wii. To do this, you need to copy the original game files to the SD card or a USB drive, so you need to already own the PC game itself. There are a few games you can download for free from the SCUMMVM website, including Beneath a Steel Sky (from the folks who went on to make the Broken Sword series) and Flight of the Amazon Queen. There are other old games you can play, including Doom and Quake (once again you need the original games, but you can also play the original freeware demos), and emulators for the Genesis, SNES, Playstation and other consoles. Besides games, there are Homebrew applications such as an FTP server, MP3 players, a metronome and, of course, Linux and Unix shells (because if there’s one thing all hackers love, it is Unix). The application you may find most useful is the media player MPlayer CE. If you often download video from the internet and watched it through your TV via the Playstation 3, you probably already know the PS3 doesn’t support a lot of video formats. Sometimes you need to convert files before you can play them. If you switch the external hard drive with your videos from the PS3 to the Wii, you may discover it can play everything you have, making your hacked Wii a better multimedia player than either the PS3 or the Xbox 360. Homebrew is not for everyone, requiring a higher degree of comfort with technology than many people have. But if you’re up to it, and if you would like to play freeware Wii games and do things on the Wii that Nintendo never intended to let you do, homebrew is a fascinating possibility. What About Wii U Homebrew? Now that the Wii has been superseded by the Wii U, you might wonder if there is homebrew for it as well. There apparently is, although you may have a Wii U that's updated to a version that can't be hacked (at the moment). The Wii U contains the software architecture of the original Wii, and that homebrew can be installed within the game's Wii mode. How Do I Restore the Homebrew Channel After I Updated My Wii? What Are the Top 5 Best Homebrew Apps for Wii? What Game Controllers Do You Need for the Wii U? Are Nintendo 3DS Games Playable on the Wii U?